The origins of the Damara people are an enigma to anthropologists. One of several puzzling aspects is that while they differ physically from the Nama and Hai||om people, they also speak the Khoekhoegowab language. Another is that although they are dark skinned, in most other respects they differ from other people of Bantu origin in Namibia. Traditionally the Damara community consists of a number of subdivisions called haoti. These are clusters of clans and extended families that were formerly concentrated in specific areas, consisting of about eleven sub-groups. The Hai||om had the widest geographic distribution in Namibia, ranging from an extensive area surrounding the Kuiseb River, south-east of present-day Walvis Bay, up towards the Swakop River; the central parts of the country from Rehoboth and Hoachanas to the Khomas Hochland, west of Windhoek; and especially the area where they are concentrated today, namely the environs of Outjo, Kamanjab, Khorixas and Brandberg. The names of various Damara groups were mostly geographic references, for example the Tsoaxüdaman, the Swakop Damara or Dâuredaman, and the Brandberg Damara. The Damara were ousted from their traditional areas by the advancing Nama and Herero. In German colonial times they settled in the Okombahe environs. In 1973 an area of approximately 4.7 million hectares was proclaimed as Damaraland, with Khorixas as its administrative capital. Following independence, this area became part of the Erongo Region. According to the latest census (2011), about 150 400 people live here, 42 400 more than in 2001. Before the arrival of the white settlers, the Damaras’ way of life was similar to that of the nomadic San insofar as they lived from hunting and veldkos. There is also ample archaeological evidence that they kept small herds of stock, especially goats, for centuries. The small family group formed the nucleus of socioeconomic activities. At the heart of their religion lay the so-called ‘sacred fire’, associated mainly with their hunting activities. In addition, they practised small-scale horticulture, growing primarily tobacco and pumpkins, and mined and smelted copper, trading with articles made from copper and soapstone. Nowadays rural Damara people cultivate corn and vegetables, while livestock production has become an important source of income. Many work on commercial farms; others in mines, with some making a living from small mining in the Erongo Region. A relatively large number are employed in urban centres as teachers, clerics and officials. Some of Namibia’s most eloquent and influential politicians are Damara, notable examples being President Hage Geingob, and the former speaker of the National Assembly, Dr Theo-Ben Gurirab, also a former Prime Minister. 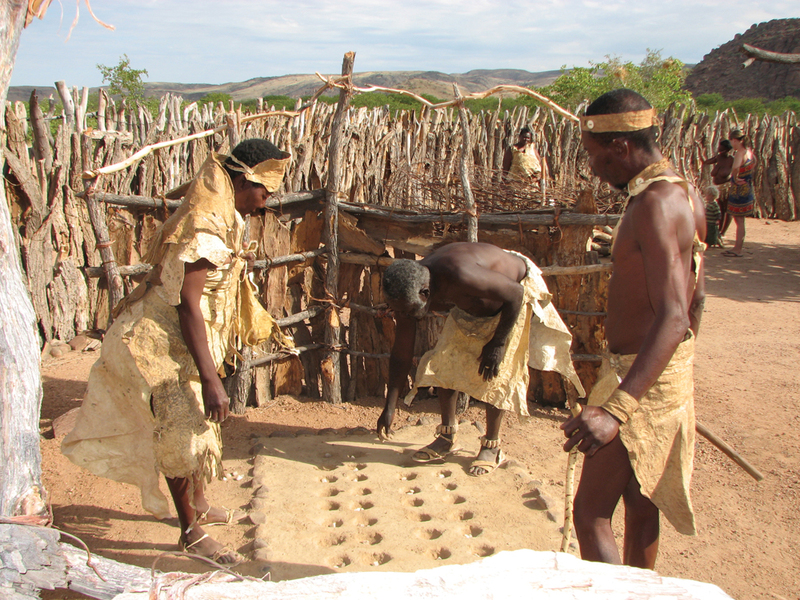 The first traditional Damara project was established close to the world-famous rock-engraving site of Twyfelfontein, where a group of Damaras built a Living Museum to show their pre-colonial dress styles and demonstrate their ancient traditions. The museum features a village with a range of huts, livestock, demonstrations of singing, dancing and games, craft-making and a blacksmith’s shop in which traditional iron tools are produced. On an interesting bush walk, visitors are shown trapping and snaring methods, and different bush food. The museum is located 8 km east of Twyfelfontein, off the D2612. The two-day annual Damara Festival takes places during November at Okombahe in the Dâures Constituency. It is aimed at commemorating deceased Damara leaders and raising awareness of Damara traditions among the younger generation through the inclusion of cultural performances. Chief Justus //Garoëb is currently serving as King of the Damara clan. He was officially crowned in 1993, after serving as acting chief from 1976 to 1993 as part of an arrangement with the late Damara King, David Goreseb. In the Erongo Region in central Namibia, mountains jut into the sky in earthly magnificence, begging exploration. Here visitors will find the Brandberg, the highest mountain in Namibia, which peaks at 2 573 metres (Königstein) and is famous for its San/Bushman rock-art paintings, especially the famous White Lady. The Spitzkoppe massif, a group of rounded granite mountains situated 60 km north-west of Usakos en route to Swakopmund, is both a popular rock climbing and camping destination. With its main peak resembling the famous Swiss mountain, it is often referred to as ‘The Matterhorn of Africa’. The Dâureb Mountain Guides offer excursions from the base of the Brandberg to view the White Lady painting in the Maack’s Shelter overhang, during which they also provide interesting information on the flora and fauna of the mountain. The paintings that can be seen on the massive Brandberg are estimated to be between 2 000 and 4 000 years old. In the heart of the old mining town of Uis, 42 km to the south, the Uis Information Centre gives advice about the area and in particular about the Brandberg, the Dâureb Mountain Guides and the walks offered to view the rock paintings. Dâureb Crafts stocks items handmade by women from the community, while Vicky’s Coffee Shop, open daily from 8:00–17:00, makes a pleasant stop for a tasty cappuccino, muffin, salad, light meal or omelette. Nestled between the huge boulders in the magnificent mountain world of the Spitzkoppe in the Gaingu Conservancy is the Spitzkoppe Rest Camp. Run by the local community, the camp offers 12 private campsites with basic facilities, surrounded by quiver trees, acacia, shepherd’s and butter trees, and set against a blue sky and ochre rock. A small restaurant offers simple meals on request and the bar sells cold drinks, beer and a few snacks. Simple showers and flush toilets are positioned near the entrance. If you’re in need of a soft bed, there are two bungalows, each with two rooms. The facilities are currently being upgraded, but are still open for visitors. Excursions are offered with local community guides from the Twyfelfontein Information Centre to view the 2,000-plus rock engravings at Twyfelfontein, a site declared a National Monument in 1952 by the government of the time, and as Namibia’s first World Heritage Site in 2007 by UNESCO; the two colourful geological curiosities, the Burnt Mountain and Organ Pipes; and the Petrified Forest, a collection of fossilised pieces of tree trunks (lying scattered among a stand of small welwitschia plants) that was declared a National Monument in 1950. En route to these features is the Aba-Huab Campsite, a busy, bustling campsite located 9 km from the Twyfelfontein engravings. With a bar, pool table, restaurant and communal ablutions, this privately-owned facility is for campers who like social interaction. Fifteen sites are positioned on one side of the road and three more private ones on the other. The majority of the sites overlook the Aba Huab riverbed. Two enchanting campsites are Doro !Nawas Granietkop Campsite, 20 km southeast from Twyfelfontein off the D2612, and Hoada Campsite off the C40 Grootberg Pass, near the town of Kamanjab. Each has three campsites nestled among the granite boulders, with showers and toilets sheltered by the rocky features.